In many cases, architectural concrete is the modern solution, whether it is for civil engineering, economic or aesthetic reasons. 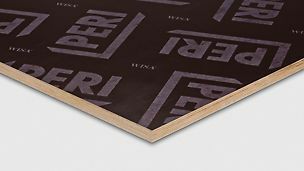 PERI provides its customers in the construction industry with practical help and support: selection, planning and supply of formlining and formwork systems which are optimally matched to the project requirements. The right formwork solution for every architectural concrete surface, from standard formwork to special designs. The best results arise from the very close cooperation between architects, contractors and PERI engineers. Architectural concrete has developed into one of the most important means of design in modern architecture. No other building material can be used and processed in such a versatile manner. Therefore, architectural concrete is used for almost all construction tasks. 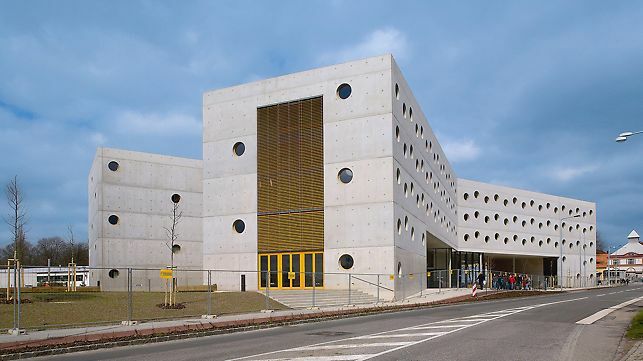 Through the design capabilities of the fresh concrete, virtually any shape and quality can be economically realised with the help of appropriate formwork systems and formlining. The different architectural concrete qualities are divided into four classes according to the DBV (German Concrete Association) pamphlet, "Architectural Concrete". The development of the building material concrete with new concrete types such as high-strength, lightly-compacted and self-compacting concretes as well as fibre-reinforced concretes (steel and textile fibres) opens up further areas of application. DIN 18217 "Concrete Surfaces and Formlining" is considered as the definitive standard for the construction of different kinds of concrete surfaces. Aesthetic references are not stipulated in this standard because there are no binding regulations for the production of architectural concrete. This is understandable as the creative intent of a planner cannot be standardised. His task is to describe as comprehensively and clearly as possible his individual ideas about the appearance of a concrete structural component. With the DBV "Architectural Concrete" pamphlet, which defines specific architectural concrete classes and the associated requirement criteria, good technical support is available to planners, those tendering contracts and contractors themselves. It is strongly recommended to put out to tender, assign and supply the services on the basis of this pamphlet. For the planning and execution of structures and structural components with special concrete surface requirements, the coordinated co-operation of all parties involved is essential. The expectations and requirements of the planners and clients must correspond to that which can be realised in the actual execution. The best solution for a good result is the creation of an architectural concrete team. As the contract has not been normally allocated in the planning phase, and no final decision has been taken regarding who will carry out the work, consultation agreements with competent specialist companies (e.g. 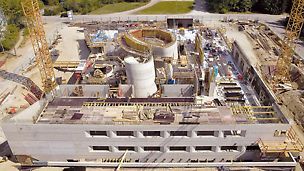 formwork manufacturer) or experienced engineering offices. The selected engineering office can then assume the role of architectural concrete coordinator in the architectural concrete team. 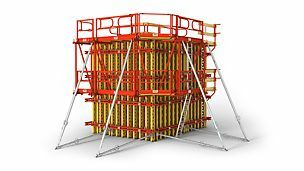 In modern formwork construction, system formwork or shuttering is primarily used which consists mainly of system components. 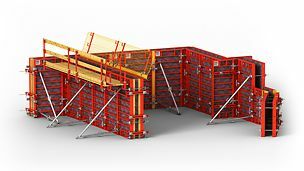 The compatibility of the individual system components has several advantages: non the one hand, the specified assembly logic increases the chance that individual formwork components are used correctly. On the other, the number of possible uses on the construction site is multiplied whereby amortization costs of the equipment used - related to a building project - are reduced. At the same time, using system formwork is much safer for the construction team. With the use of formwork systems for architectural concrete surfaces, the quality of the formwork is to be taken into consideration. Panel formwork is mainly used as the rental formwork supplied by the rental parks. 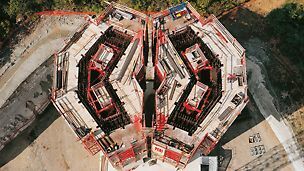 Here, the individual formwork elements have different utilisation rates and can also feature repaired areas. With rental formwork, only SB 1 and SB 2 architectural concrete classes can be achieved. Realising the higher SB3 and SB 4 classes of architectural concrete is not possible or only possible to a limited extent using rented panel formwork, for example with PERI MAXIMO. In traffic route construction - for example, bridges, tunnels or retaining walls - architectural concrete is regarded as an important design element. These concrete surfaces are often observed only from a distance or vehicles driving past at speed. In order to create optical accents, clear design elements therefore must be selected. For example, formwork panel joints or those joints resulting from working phases, must be distinctly formed. However it is important to note that many components of these structures are mainly exposed to the direct influences of the weather. This means they undergo a rapid aging process and, in the course of time, also greatly change their appearance. With wall formwork systems, a distinction is made between panel formwork and girder formwork. 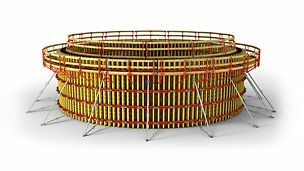 A special feature is represented circular formwork systems. Today, around 70% of building companies use panel formwork in order to construct concrete walls. The name is derived from the peripheral frame which protects the edges of the fitted formlining against mechanical wear and stress. As a result, the panel joints leave a typical impression on the concrete surface. 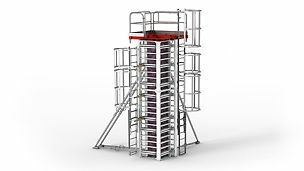 In addition, the steel or aluminum frames are used for installation of the formwork anchors and also serve for accommodating the formwork couplers and moving devices. The main principle of panel formwork is embodied through the PERI TRIO. 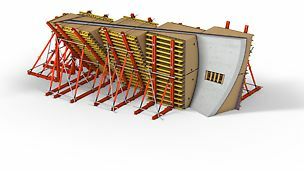 Other panel formwork systems are similar in their respective concrete finish. 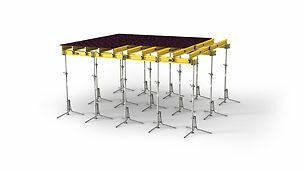 The grid arrangement of the standard panels and formwork ties varies between 2.70 m and 3.50 m, and the individual panels can be connected with each other either vertically or horizontally. 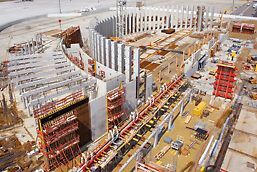 Panel formwork is robust, long-lasting and easy to use due to its pre-determined assembly arrangement. Girder formwork is used much less today than was previously the case, and mostly for special applications. Its name is derived from the wooden or metal formwork girders that are used. Main beams, steel waling and freely-selectable formlining form prefabricated formwork elements, the so-called formwork sections. 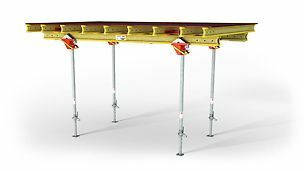 The steel walers connect the system and also serve as support surfaces for the anchoring system. The main principle of girder formwork is embodied through the PERI VARIO GT 24. Other panel formwork systems are similar in their respective concrete finish. The grid arrangement of the standard elements and formwork ties can vary. 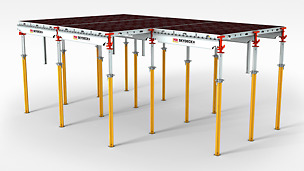 Prefabricated sections with pre-determined element sizes stored in rental parks, partly equipped with formlining for secondary requirements and as supporting panel for architectural concrete formliner. These formwork sections are project-planned and produced according to special requirements. 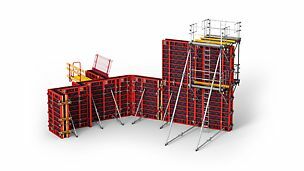 The formlining (type, size, fixing), girder and waling (spacings) as well as the tie arrangement are freely selectable whilst taking into account the system´s principles. Curved walls can be constructed polygonally in the form of a polygon with panel formwork through inserted trapezoidal cover strips. 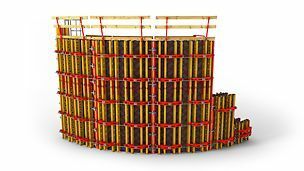 Circular wall areas are formed with special girder formwork systems with which the required radius is achieved by means of adjustable spindles connecting the single waler sections. Bending radii are continuously possible from 1.00 m to approx. 20.00 m. The curvature of the formlining is achieved through special profiled timber - cut to match the curvature radius - which is inserted between the formlining and girder position. Likewise as for girder formwork systems for walls, slab formwork is made out of wooden or metal girders. It stands out through its flexible range of applications. 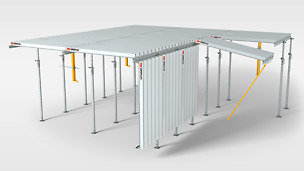 Slab tables, which are normally used to form large slab areas, consist of the same system components. 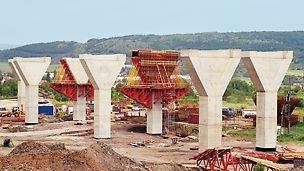 Through the large-sized formlining surfaces, the number of panel joints is reduced and facilitates a concrete finish which fully meets higher requirements. With slabs, the quality of the concrete surface can vary for different reasons. This includes panel impressions caused by the panel layout of the formwork system being used. Likewise the quality, arrangement and size of the individual sheets of the freely selected formlining influences the concrete quality. Column or support formwork is mostly a derivation of panel or girder formwork. As a result, the special features are very similar. 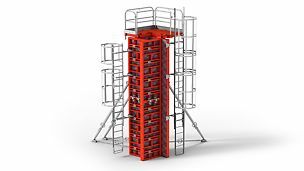 In order to be able to fulfil the required quality standard for supports and columns, the correct choice of formwork system also has to be selected here. Depending on the requirements of the column cross-section, the finish of the edges or the concrete surface, panel and girder formwork are used. Through the use of extraordinary structural forms, owners and architects frequently set visual accents in the construction of cultural buildings or for prestigious structures which feature very demanding building requirements. These so-called 3D free-form surfaces can hardly be realised with conventional formworking methods. Furthermore, there is the fact that most of the remaining visible surfaces are to be constructed in the highest quality and with sharp edges. For these extravagant building structures, an individual customised formwork concept must be realised in each case. This formwork concept is developed on the basis of a three-dimensional building model provided by the formwork manufacturer. 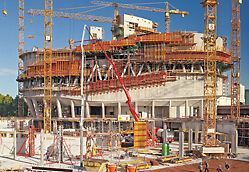 It consists of statically supporting basic elements and form-giving 3D formwork units. 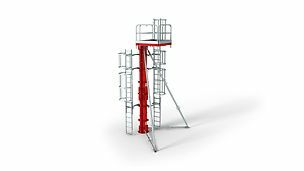 The individual elements are easily joined together on the construction site and then positioned with the help of measuring points, auxiliary axes and erection aids. 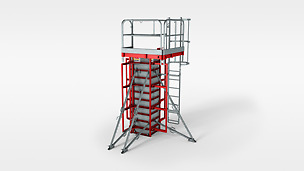 On-site utilisation takes place similar to that of systemized formwork. Through the selection of the formlining, a large number of design possibilities for the concrete surface structure are possible. In the process, the formlining determines the surface character of the concrete - independent of any subsequent processing or treatment. The person writing the tender documents must have detailed knowledge of the formlining together with the material properties, coatings and processing as well as the interaction with the release agent and the fresh concrete, and take this into account during the planning. The specifications of the concrete surface must be well-defined so that the contractor can take into consideration all aspects relevant to the materials and applications without any risk when selecting the formlining to be used. Furthermore, he must be able to assess the feasibility and to point out any expected tolerances and fluctuations in the results. Today's structural designs and building methods allow the realisation of impressive architectural concepts. In this respect, we would like to present a number of projects featuring a wide range of variants. 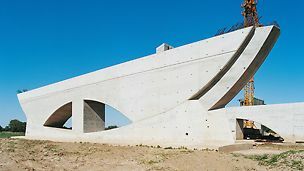 For many years now, architects have re-discovered the potential of architectural concrete in building construction and to use it as an important design element. Parallel to the development of building materials and process technologies, the requirements have also risen quite significantly. 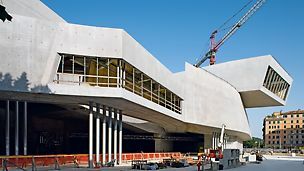 High-strength as well as liquefied through to self-compacting concretes facilitate the realisation of more slender concrete constructions along with more diversified forms. Curved and inclined walls and slabs are a frequently featured design element. 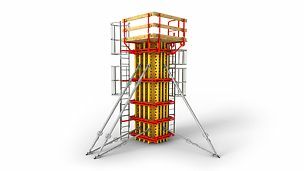 The formwork construction industry has adapted itself to the situation accordingly. The desire for achieving smooth, joint-free concrete surfaces as far as possible can be satisfied with the range of available large-sized formlining. Components in the protected inner areas are not exposed to weathering, therefore the aging process of these concrete surfaces takes place substantially more slowly. Concrete surfaces on the inside areas of a building are viewed at very short distances. Therefore, details will become considerably more accentuated. Due to this reason, architectural concrete classes SB3 and SB4 are frequently demanded by architects. As a result, the planning architects together with the building contractor should define what is feasible in order to achieve the required architectural concrete finish. Otherwise excessive demands and rectification work will cause inadequate and unsatisfactory results. Particularly in the area of cultural buildings, architects and project planners prefer architectural concrete as a means of design. Apart from artistic requirements regarding the visibly remaining concrete surfaces, the special forms of the complete structures or individual components also frequently dominate proceedings. During the formwork planning attention should be paid to ensure a neat joint and tie pattern as well as an orderly arrangement of the formwork elements. This is because the panel joints and tie pattern along with the formation of the tie points are substantial design elements in architectural concrete. In order to achieve a uniform finish of the concrete surface, special attention must be paid when selecting the type of concrete to be used and the entire processing technology of the concrete including any subsequent treatment. 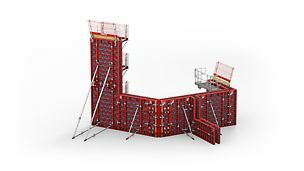 If increased requirements are placed on the appearance of the concrete surfaces, it is advisable that new formlining is installed in the formwork. If required, the anchor pattern can be supplemented with blind anchors to form a neat symmetrical arrangement. 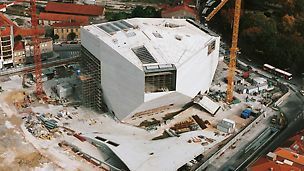 For the invitation to tender for architectural concrete in the construction of cultural buildings, it is recommended to take architectural concrete classes SB3 and SB4 of the DBV of instruction card into consideration.